I didnt want to try to make it in case it was easy and then I would never stop making it. It may mean that I never leave the house again due to pure gluttony. 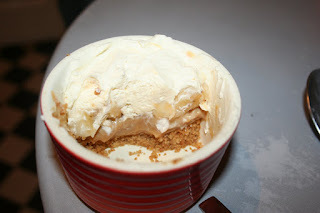 Banoffee is simply one of my favourite desserts and is dead simple to make, so easy in fact that it would be really hard to go wrong. So when a friend of mine who has been sick recently asked would I make it for his birthday party I made 2 big ones (one for the party and one for family) and 2 small ones for myself. Melt the butter in a saucepan and mix the biscuits in. Line the base of the tin/ramekins and press down with a spoon. Let it set for a while in the fridge. 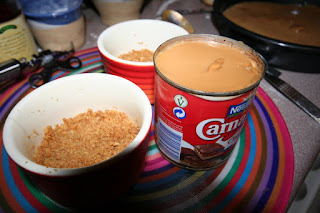 Open the condensed milk after the 3 hours and spread over the biscuit. I defy you not to stick your finger in to taste it. In fact I defy you not to give up at this stage and run off with your tin of toffee. At this stage you can leave it like this in the fridge until you are almost ready to eat and add the chopped bananas and whipped cream at that stage. Alternatively if you want to be uber organised cut your bananas in slices and toss with the juice of half a lemon. Place the bananas on top of the toffee and cover with whipped cream and it will keep nicely until you give in and eat it. If you have never had banoffee before you are most certainly cursing me now. Im sorry. If it hadnt been for my friends birthday Id be cursing him too. Oh and look at the enjoyment on that face - as good a reason as any to make this! Wow that plate has plesure heaped and splattered all over it !!! and let me tell you folks the even bigger slice i had at 9am sunday morning was even better !!!!!!!!!! I can vouch for that recipe... undoubtedly one of Deirdre's specialities!